Lille, France (Nov. 6, 2017) - In Davis Cup competitions, the home team has the right to choose the ball and the playing surface. This is what makes the competition different and unique from others. For the upcoming finals to be played at Lille Nov. 24-28, the players on the French National team have made their ball choice: they will play with the Tecnifibre X-One tennis ball. 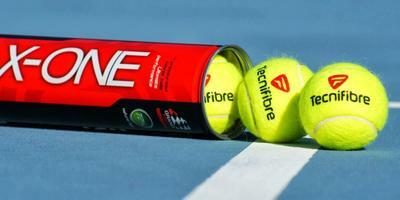 The X-One ball is the official ball of numerous ATP 250/500 tournaments such as Marseille, Rotterdam and Gstaad. It is a top quality ball designed for play at the highest level. Manufactured in a factory jointly owned by Tecnifibre and Bridgestone, the key characteristics of the balls are liveliness, speed and durability. In February, the captain of the French team, Jo-Wilfred Tsonga, won the Marseille and Rotterdam tournaments, both which were played with the X-One ball. These titles helped the French team in their decision-making process as they considered many different balls. Tecnifibre will also become the Official Supplier to the Davis Cup by BNP Paribas 2017 finals between France and Belgium.